When you purchase a new computer with Office preinstalled, you may notice that Outlook, Access, and Publisher are missing. First, try the steps in Can't find Office applications in Windows 10, Windows 8, or Windows 7? to ensure you aren’t overlooking them. If you still find that Outlook, Access, and Publisher are missing, continue with the following steps. The first step is to activate Office if you haven't already done that. When you start any Office app such as Word or Excel for the first time, you will be presented with a dialog that allows you to Try, Buy, or Activate Office. If you haven't already selected one of these options and you want more information on which option is best for you, see Try, buy, or activate Office that's pre-installed on a new computer. Once Office is activated, the next step is to update Office. Office might update automatically in the background or you can select to manually update Office. Note: If an Office app is left open for more than 5 days without installing the update, it will show as an Unlicensed Product and most of the app's features will be unavailable until you install the update. In this case, simply select Update Now to apply the update. Once you activate Office it might start downloading the missing apps right away in the background. If you have an Office app open, a notification will appear in the bottom corner of your screen to tell you an update is available. Select Click here to install the Office updates. This notification appears only if you have an app open. Open an Office application, such as Word or Excel, and select New to create a new document. Choose File in the top left corner, and then choose Account from the list on the left. 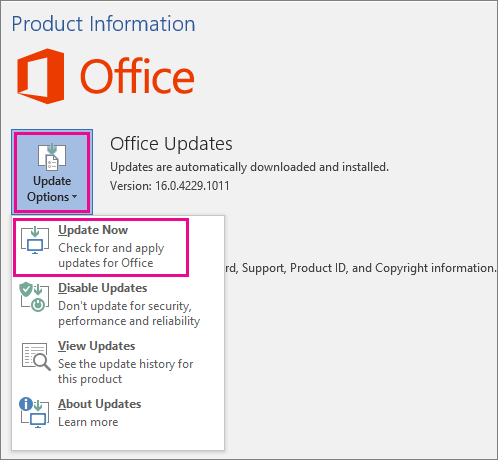 If you don't see a note that says Updates for this product are available for download, choose Update Now to manually check for and install Office updates. If you see a dialog telling you to save your work so that Setup can close any open Office apps, save any work you want to keep in the open apps, and then select Continue. Close the "You're up to date!" window after Office is done checking for and installing updates. Once Office is done updating, you will see the shortcuts for Outlook, Access and Publisher on your Windows 10 Start menu. If you don't see Outlook, Access, and Publisher after updating Office, see Can't find Office applications in Windows 10, Windows 8, or Windows 7? Note: If you do a Push-Button Reset, your computer will reset to the factory settings and you will have to follow these steps again to get your other apps back and updated.